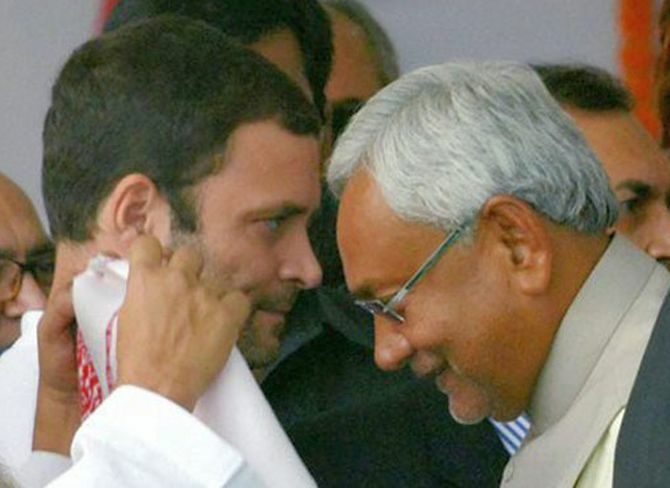 Bihar Chief Minister Nitish Kumar on Tuesday attributed his sudden exit from the opposition alliance to Congress president Rahul Gandhi's "inability" to take a stand on corruption charges against his former deputy and Rashtriya Janata Dal leader Tejashwi Yadav. 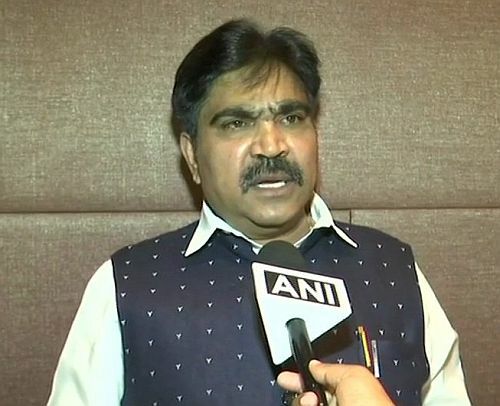 Kumar, who also heads the Janata Dal-United, claimed that his party was instrumental in the Congress getting 40 seats to contest in the 2015 assembly polls. The chief minister said he had felt let down by Gandhi, then the party's vice-president, when he "did not come up with even a statement that could have made me have second thoughts (about leaving the alliance)". "It has been always my line that there will be no compromise on crime, corruption and communalism. Their (RJD's) style of functioning was such that it was becoming increasingly difficult for me to work. There was interference at all levels. Their people would telephone police stations with their own decrees," Kumar claimed. He was speaking at an event here organised by a private news channel. "Rahul Gandhi had famously tore that ordinance. It was the JD-U which insisted that it (Congress) be given 40 seats and they ended up winning 28. The RJD, despite its old association with it, was never ready to give it that much weightage," Kumar said. Stating that he resigned as he had no other choice, Kumar said his resignation was immediately followed by an offer of support from the BJP. "So I took the decision (to join hands with the BJP) in the interests of Bihar," he said. Senior Congress leader Kapil Sibal attacked the BJP-led Uttar Pradesh government on Tuesday over the invoking of the National Security Act against three persons arrested in connection with an alleged cow-slaughter incident, saying the NSA for those accused of killing cows while freedom for those involved in the killing of a policeman. The Bulandshahr district administration on Monday invoked the NSA against three persons arrested in connection with an alleged cow-slaughter incident in Siyana tehsil last month. Cattle carcasses were found strewn in the fields outside Mahaw village in Siyana on December 3 last year after which a mob went on a rampage, attacking the local Chingrawathi police post. Inspector Subodh Kumar Singh (44) and a civilian -- Sumit Kumar (20) of Chingrawathi village -- died of gunshot wounds received in the ensuing violence. "Wah Yogi ji (Uttar Pradesh Chief Minister Yogi Adityanath)...NSA for those accused of killing cows. Freedom for those involved in killing Inspector Subodh Kant Singh," Sibal said in a tweet. "When law is allowed to be obstructive, agendas become destructive," the former Union minister added. Two separate FIRs -- one for the violence against nearly 80 people (including 27 named) and the other for cow slaughter -- were registered at the Siyana police station. 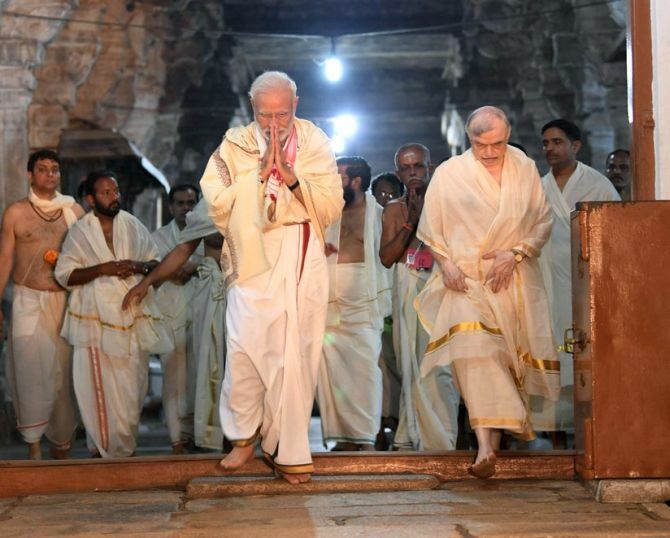 22:50 PM offers prayers at Padmanabhaswamy temple: Prime Minister Narendra Modi offeres prayers at the centuries-old Sree Padmanabhaswamy Temple in Thiruvananthapuram, known as one of the 108 'divyadesams' of Lord Vishnu. With Congress president Rahul Gandhi mocking the prime minister for being awarded the Philip Kotler award, the marketing guru took to Twitter to congratulate Narendra Modi for the honour and hailed his "selfless service towards India". He said Modi's efforts in India have resulted in "extraordinary economic, social and technological advances". 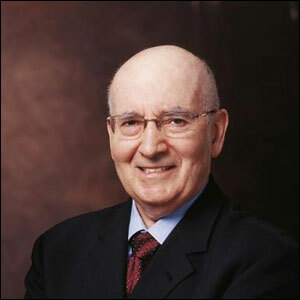 "His winning the first Philip Kotler Presidential award raises the bar for future recipients," the marketing guru said. Gandhi earlier took a dig at Modi saying he wanted to "congratulate" him on winning the "world famous" Philip Kotler Presidential award. "In fact it's so famous it has no jury, has never been given out before & is backed by an unheard of Aligarh company. Event Partners: Patanjali & Republic TV :)," he said on Twitter. In a sharp retort, Union minister Smriti Irani, while tagging Gandhi's tweet, suggested that unlike Prime Minister Modi, who was awarded by someone else, Gandhi family members had conferred themselves the country's top civilian honour --Bharat Ratna. "Rich !!! Coming from a person whose illustrious family decided to confer the Bharat Ratna' on themselves," she tweeted. 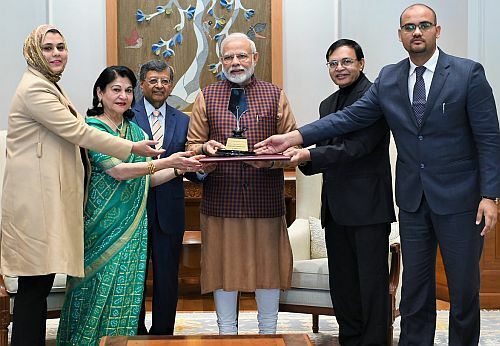 Modi had on Monday received the first-ever Philip Kotler Presidential award here. According to a statement from the Prime Minister's Office, the award focuses on the triple bottom-line of 'people, profit and planet' and will be offered annually to the leader of a nation. The condition of Union minister Ravi Shankar Prasad, who is admitted to AIIMS, is stable, hospital sources said on Tuesday. The Reserve Bank of India on Tuesday said it would inject Rs 10,000 crore into the system through purchase of government securities on January 17 to increase liquidity. The purchase will be made through open market operations. Former Arunachal Pradesh chief minister and senior Bharatiya Janata Party leader Gegong Apang has resigned from the party, saying it was no longer following the principles of the late Atal Bihari Vajpayee. "I am disappointed to see that the present day BJP is no longer following the principles of the late Vajpayeeji," Apang said in his resignation letter sent to BJP chief Amit Shah. "The party is now a platform to seek power. It serves a leadership which hates decentralisation or democratic decision making and no longer believes (in the values) the party was founded for," he added. 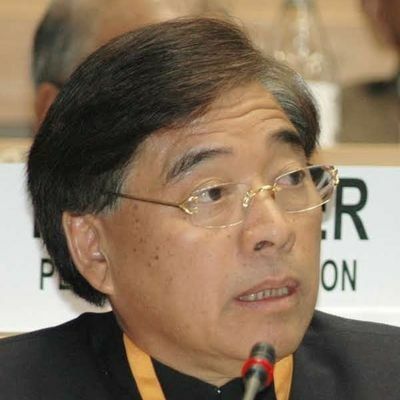 Apang said the BJP did not get the people's mandate in 2014 in Arunachal Pradesh. "But the BJP leadership used every dirty trick in the trade and installed the late Kalikho Pul as chief minister. Despite an adverse Supreme Court ruling, a BJP government was reinstalled. Neither a proper investigation was done in Pul's suicide nor the present BJP leadership thought of morality and ethics by installing many more BJP governments in the northeast," said Apang. He said that during the state level executive committee meeting held on November 10 and 11 at Pasighat, BJP general secretary Ram Madhav did not allow many members and office bearers to place their views. "The decision to put Pema Khandu's name as chief minister before the election is neither the norm nor the tradition that a cadre-based party like BJP had followed. The BJP in the past has always asked the views of legislature and party members and then decided on leadership issues. Such undemocratic practices are not for the parties that grew under the leadership of Advani, Vajpayee, BS Shekawat, Kushabhau Thakre, Madan Lal Khurana, Rajmata Scindia and Sikandar Bakhl," he added. It was a different battlefield a 'relaxed' chief minister H D Kumaraswamy watched amid the political crisis in Karnataka ahead of Lok Sabha polls. Taking time off from the turmoil his government is facing due to two MLAs withdrawing support to the government, Kumaraswamywatched a trailer of the movie 'Kurukshetra', the Kannada period movie based on the Mahabharata, based on the poetic marvel 'Gadayuddha' by poet Ranna. His son Nikhil Gowda has played the role of Abhimanyu. The movie has been produced by MLA Muniratna. Enthralled with the trailer, Kumaraswamy said never before a movie of this scale ever been made inKannada, where every minute detail was taken care of. Singer Alicia Keys will be hosting the 2019 Grammy Awards. The 37-year-old singer made the announcement on her social media channels with a behind-the-scenes video. Amid criticism over filing of chargesheet after almost three years in the Jawaharlal Nehru University sedition case, the Delhi Police has said such cases "generally take such time" as it involved probe spread across the country and involved voluminous records and evidence. 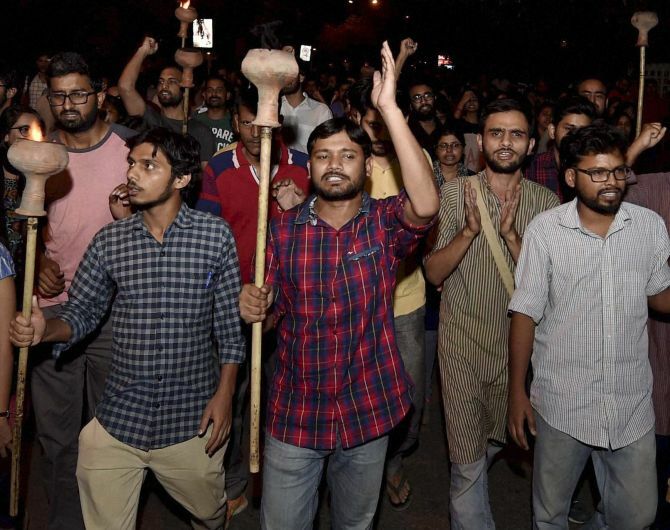 The police on Monday filed the 1,200-page chargesheet in a Delhi court against former Jawaharlal Nehru University Students' Union president Kanhaiya Kumar and others, saying he was leading a procession and accused him of supporting seditious slogans raised on the campus in February 2016. Kumar and others have questioned the delay in filing of the chargesheet, alleging that its timing just a few months before the general elections had political undertones. A core member of the investigating team, however, said it was not a delay as "these kind of cases generally take such time". "The probe was spread across the country. A lot of evidence had to be collected, which also included the statement of a large number of accused and suspects as well as the witnesses," he said. He said the maximum time was consumed in the interrogation of accused/suspects and witnesses of the case. 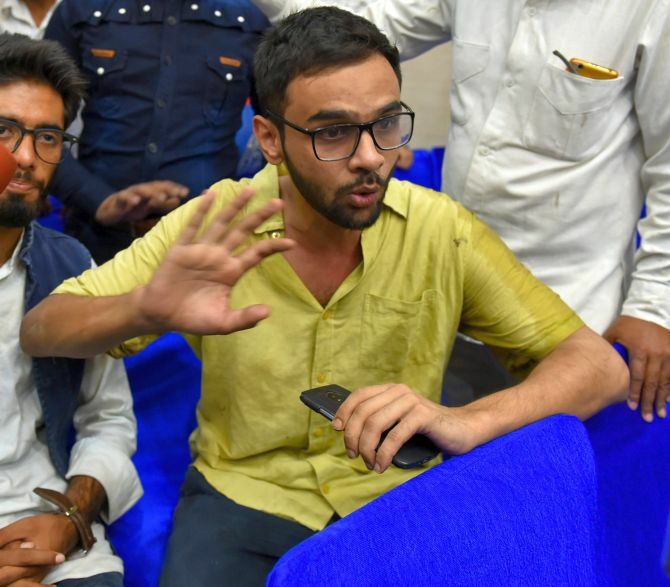 Police has also charged former JNU students Umar Khalid and Anirban Bhattacharya for allegedly shouting anti-India slogans during the event held on the JNU campus on February 9, 2016 to commemorate the hanging of Parliament-attack mastermind Afzal Guru. In its chargesheet, the police has claimed that it has video clips to prove the offence which has been corroborated by the statements of the witnesses. Police has alleged that Kumar had incited the mob to shout anti-India slogans. The pre-requisite for ensuring growth is a decisive leadership, consistency in policy direction and a strong and stable government, and not "an unworkable alliance with maverick leadership whose longevity is a suspect can never achieve this" he said in the blog titled 'Political stability, Decisive Leadership and a Clear Mandate - Their Relationship with Growth' . 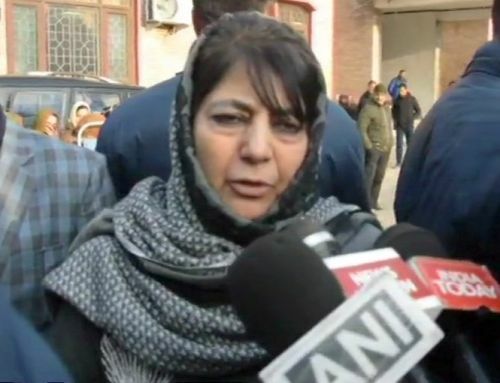 Terming local insurgents as "sons of soil", Peoples Democratic Party chief Mehbooba Mufti Tuesday said efforts should be made to save them, adding the Centre should initiate dialogue with the insurgents leadership in Jammu and Kashmir to end the "gun culture". "Right now, talks should be held with Pakistan and separatists. 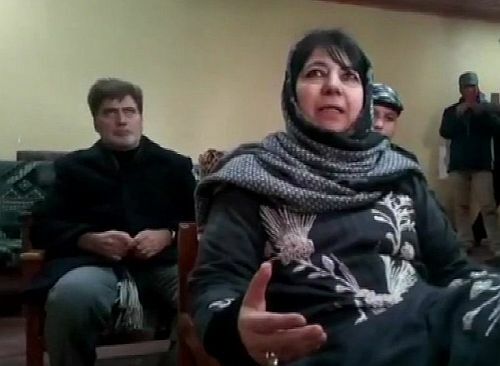 Similarly, the militant leadership should also be talked to as it is they who have the guns and only they can end the gun culture," she told reporters in Anantnag after a party function. "I believe at some stage, talks will have to be held with Hurriyat Conference and militants as well," she said. The former chief minister, however, said it was "too early (for talks with militants)". Mehbooba said local militants should be prevented from walking on the path of violence. "Right from the time I came into politics in 1996, I have been saying that local militants are sons of the soil and our maximum efforts should be to save them because they are assets. 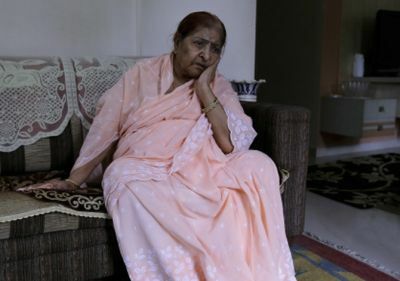 "If an encounter breaks out, the two people (militants and security forces) come face to face and no one can do anything about it then," she said. The PDP president had on Monday questioned the timing of filing of chargesheet in the 2016 JNU sedition case, in which seven Kashmiris have been named, saying the students were being used to score political points ahead of Lok Sabha elections. "No surprises here. We are months away from the 2019 general election and like always, using Kashmiris to score extra political points with the Indian electorate has become somewhat of a pre-requisite," she had said in a series of tweets. The country's exports growth remained almost flat in December 2018, recording a marginal expansion of 0.34 per cent to USD 27.93 billion, mainly on account of global trade tensions. Subdued exports and declining imports have narrowed the trade deficit to ten-month low of USD 13.08 billion in December 2018 as against USD 14.2 billion in the same month previous year. According to trade data released by the commerce ministry, in last December, exports grew by 0.34 per cent (lowest in three months), while imports entered negative zone, registering a decline of 2.44 per cent to USD 41 billion. Last time, imports had plunged into negative territory in September 2016. It was dipped by 2.54 per cent then. The import of gold too contracted by 24.33 per cent to USD 2.56 billion in December 2018. During the month under review, several key export sectors recorded negative growth. It includes engineering goods, gems and jewellery, leather, pharmaceuticals, marine products, iron ore, tea and coffee. Commenting on the figures, exporters body FIEO said that the marginal growth in exports was due to uncertain global cues and challenges on the domestic front. "China's exports contracted in December 2018, highlighting fragile global conditions. The weak global economic outlook are showing no signs of respite," Federation of Indian Export Organisations (FIEO) President Ganesh Kumar Gupta said. 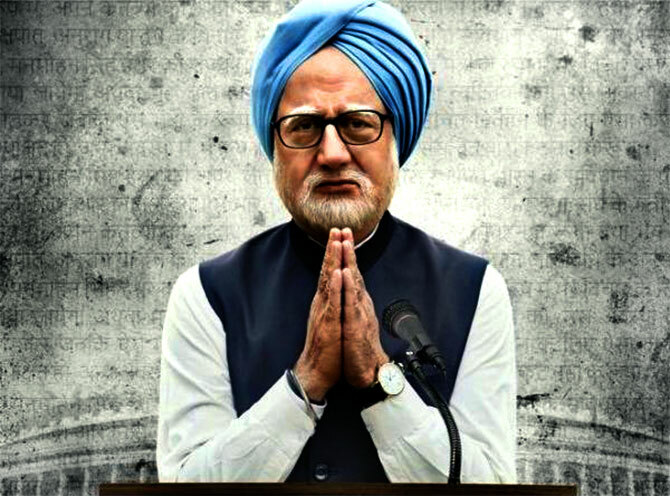 Former National Security Adviser M K Narayanan on Tuesday asserted that "80 per cent of the claims" made in the book, The Accidental Prime Minister: The Making and Unmaking of Manmohan Singh, were "false". Baru had written the book during the 2014 Lok Sabha elections to make money, alleged the NSA, believed to be close to the former PM. "It's a book full of lies. Eighty per cent of his claims are false. He was not a big player of the game (in the government). 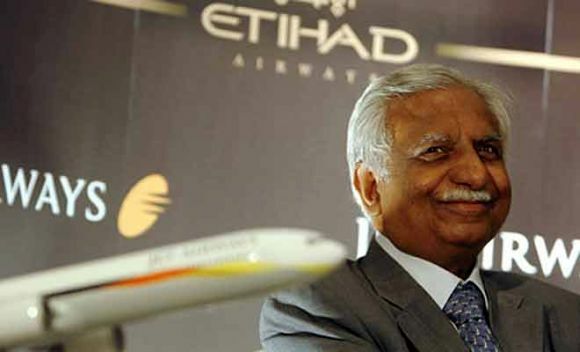 He was nobody," Narayanan said in a session with the Bharat Chamber of Commerce. He alleged that Baru could not manage the media and ran away in 2008 as he had thought the Congress-led United Progressive Alliance government would not return to power. 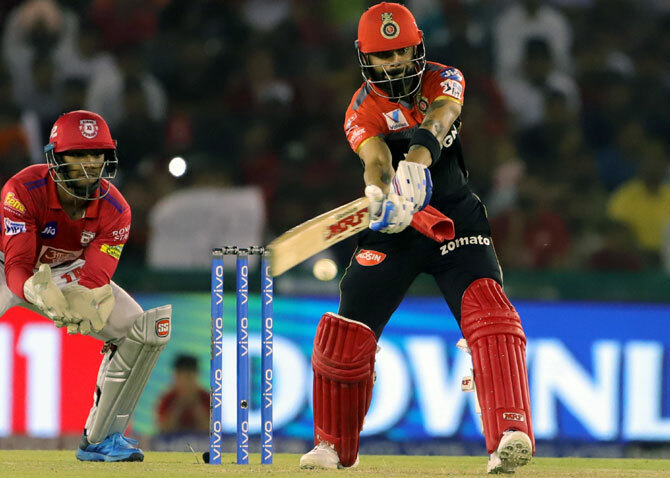 Promising all-rounder Aniket Sharma on Tuesday collapsed on a cricket field and died moments later owing to a possible cardiac arrest, hospital officials said. Aniket, 21, from Paikpara Club, was brought dead to RG Kar Medical Hospital. A southpaw, who could also bowl right-arm off spin, Aniket joined the club last year and according to his coach was a fine talent. "He was a good cricketer. He was a brilliant team man and a good fielder too. We are shocked to say the least," his coach said. "We were all there on the field, warming up. He wanted to play football for some time. But before that, while warming up he suddenly collapsed on the field and we rushed him to the hospital," a teammate said. Aniket's club Paikpara were scheduled to take on Milan Samiti in a Cricket Association of Bengal First Division League match. "We are trying to postpone the match which is scheduled for tomorrow. This is a very unfortunate incident and we are shocked," said CAB joint secretary, Avishek Dalmiya. Former Bengal captain Sambaran Banerjee, who runs a club of his own, expressed shock at the incident too. "I have no words to express how sad I am. This is too tragic." 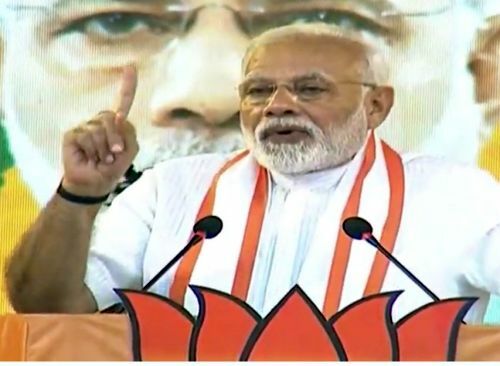 Prime Minister Narendra Modi Tuesday launched a scathing attack on the left government in Kerala on the Sabarimala issue, saying Communists do not respect India's culture and spirituality. 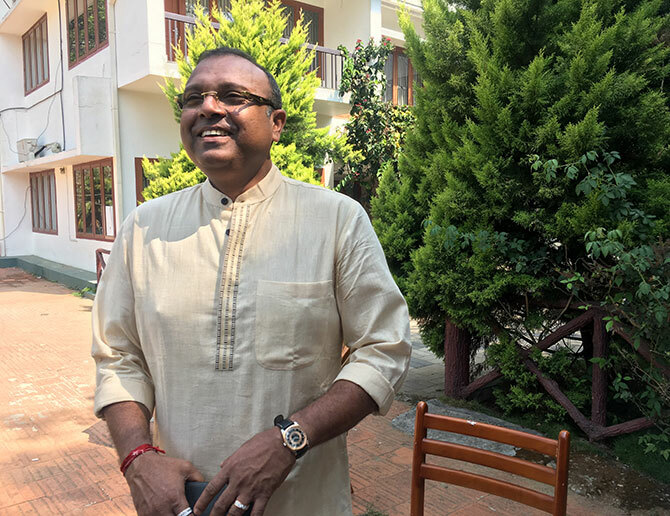 Hitting out at the Communist Party of India-Marxist-led Left Democratic Front and the opposition spearheaded by the United Democratic Front in the state, he said both the fronts were two sides of the same coin and accused them of neglecting people of the state. "We know that the Communists do not respect India's culture, history and spirituality," Modi said at a public meeting in Kollam. The BJP would stake claim to power in Karnataka if the Congress-JDS coalition government falls, Union minister D V Sadananda Gowda said on Tuesday, hours after two Independent legislators in the state withdrew support from the seven-month-old Kumaraswamy dispensation. 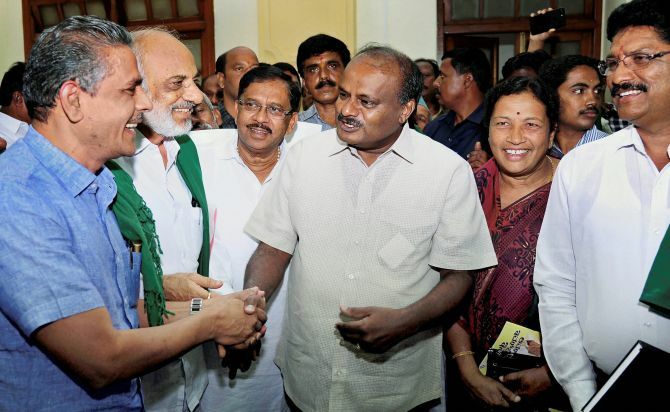 Gowda said the Kumaraswamy government would collapse on its own due to squabbling and that the Congress-JDS 'friendship" was on the "brink of divorce". "The friendship is at the brink of divorce. It is time for break-up. A party with 37 seats has formed the government. It will collapse on its own due to squabbling. If the government collapses, we will certainly form the government," he told reporters here. 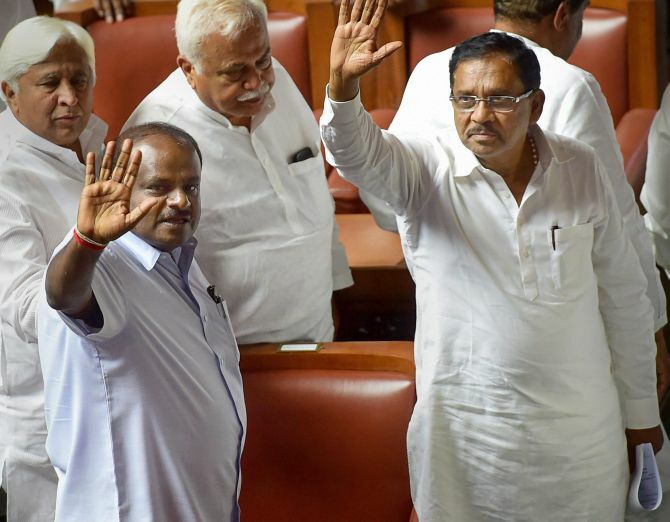 Gowda was replying to a query on whether there was any likelihood of the BJP staking claim to power in the event of the collapse of the coalition government. The Congress and JDS had formed the government after the May 2018 assembly polls threw up a fractured verdict with the BJP emerging as the single largest party with 104 seats in the 224-member Assembly. The Congress had secured 79 seats and the JDS 37. 17:55 Modi couldn't walk the path of Vajpayee: Mehbooba: Former J&K CM Mehbooba Mufti: We shook hands with BJP as they had the mandate. We want to have talks on Jammu & Kashmir issue just like Vajpayeeji held talks with Hurriyat and Pakistan. But Modiji couldn't walk on the path of Vajpayeeji even though he had the mandate. 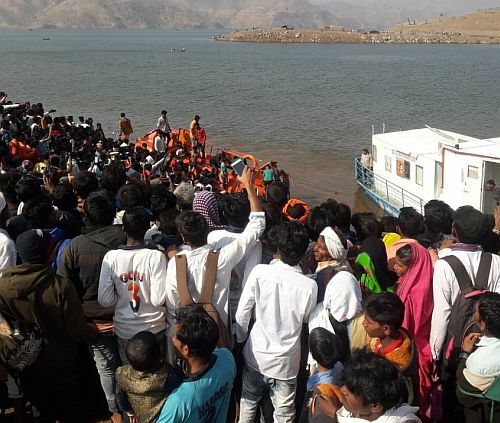 17:38 Six Sankranti pilgrims drown as boat capsizes in Narmada : Six persons died Tuesday after a boat ferrying them capsized in the Narmada river in Maharashtra's Nandurbar district, police said. Altogether 36 persons have been rescued so far, and are admitted to a local hospital, an official said. The International Cricket Council today appointed media professional Manu Sawhney as its new chief executive officer, replacing incumbent David Richardson, who will step down after the World Cup. 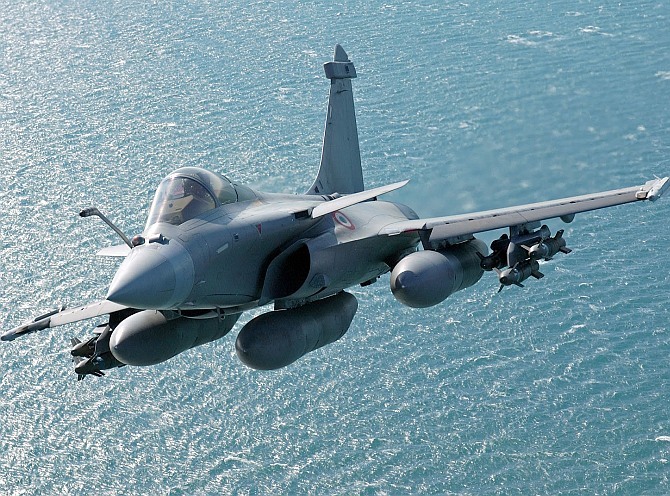 The Comptroller and Auditor General has refused to disclose details about its audit in the controversial Rafale aircraft deal, saying the process is not yet complete and any disclosure at this stage will amount to breach of the Parliament's privilege, an RTI reply said. It rejected the pleas seeking lodging of an FIR and a court-monitored probe alleging irregularities in the Rs 58,000 crore deal, in which both the countries have entered into an inter-governmental agreement. "The pricing details have, however, been shared with the Comptroller and Auditor General, and the report of the CAG has been examined by the Public Accounts Committee. Only a redacted portion of the report was placed before the Parliament and is in public domain," the bench led by Chief Justice of India Ranjan Gogoi had said, relying on the sealed note submitted by the government. 16:15 I know my strength, says a confident Kumaraswamy : Karnataka CM HD Kumaraswamy reacts to two independent MLAs withdrawing support. "If the two MLAs withdraw their support, what will be the numbers? I'm totally relaxed. I know my strength. Whatever is going on in media in the past week, I am enjoying." H Nagesh (Independent) and R Shankar (KPJP) have written to governor Vajubhai Vala conveying their decision. In separate identical letters, available to the media here, the lawmakers said they were withdrawing support extended to the coalition government of the Congress and the JDS with immediate effect. The MLAs, who are now staying in a Mumbai hotel, requested the governor to take "necessary action." Both the Congress and the BJP have been accusing each other of trying to lure legislators. 16:01 Indian killed in Afghan bomb attack: MEA: An Indian national was among those killed in the terror attack in Afghanistan's capital on Monday, the Ministry of External Affairs said and called for the perpetrators of the assault as well as those who provide them shelter to be brought to justice expeditiously. 15:53 Will take care of Mayawati's farm loan waiver concerns: MP CM: Madhya Pradesh Chief Minister Kamal Nath Tuesday said his government will take care of BSP supremo Mayawati's concern over waiving off loans of farmers who had borrowed from money lenders. Nath was answering a question on Mayawati's concern over 100 per cent benefit to farmers under the scheme, including those who had borrowed from money lenders. 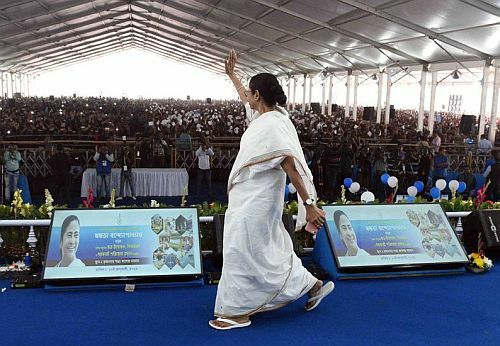 15:48 SC asks Bengal govt to allow BJP's rath yatra: In a big blow to West Bengal CM Mamata Banerjee, the Supreme Court Tuesday asked the Trinamool government to allow proposed public meetings and rallies of BJP under its "Ganatantra Bachao Yatra". A bench headed by Chief Justice Ranjan Gogoi asked BJP's West Bengal unit to submit a revised schedule of its proposed 'Rath Yatra' with the authorities and seek necessary approvals. The bench also comprising Justices L N Rao and SK Kaul asked the West Bengal government to consider the revised schedule of BJP for 'Rath Yatra' keeping in mind the fundamental right of speech and expression under the Constitution. 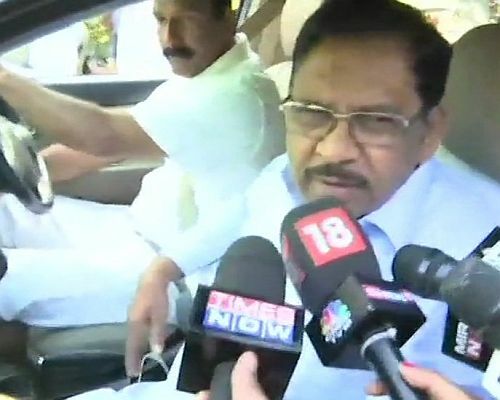 15:25 Our govt stable: K'taka Dy CM: G Parameshwara, Deputy Karnataka CM on two independent MLAs withdrawing their support: We have been saying that BJP is luring our MLAs through money and power but their attempts to destabilise the govt will fail. Our govt is stable. 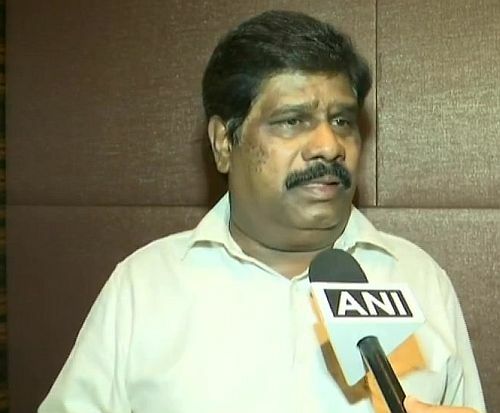 15:21 No understanding among coalition partners: Independent MLA: H Nagesh, Independent MLA, Karnataka: My support to the coalition govt was to provide good and stable govt which utterly failed. There's is no understanding among coalition partners. So, I decided to go with BJP to install stable govt and see that govt performs better than the coalition. 15:16 Supreme Court asks West Bengal government to allow rallies and meetings of BJP in state. 15:12 2 Independent MLAs withdraw support from K'taka govt, to join BJP: Two Independent MLAs, H Nagesh and R Shankar, withdraw their support from the Karnataka govt. Both the MLAs say they will support the BJP. The JD-S-Cong government had denied them a ministerial berth. Nagesh and Shankar had been holed up in a hotel in Mumbai and have expressed their dissatisfaction with the government. The BJP now is six short of forming government. Though the BJP won 104 seats in the Karnataka election, it was eight short of the majority mark of 111. 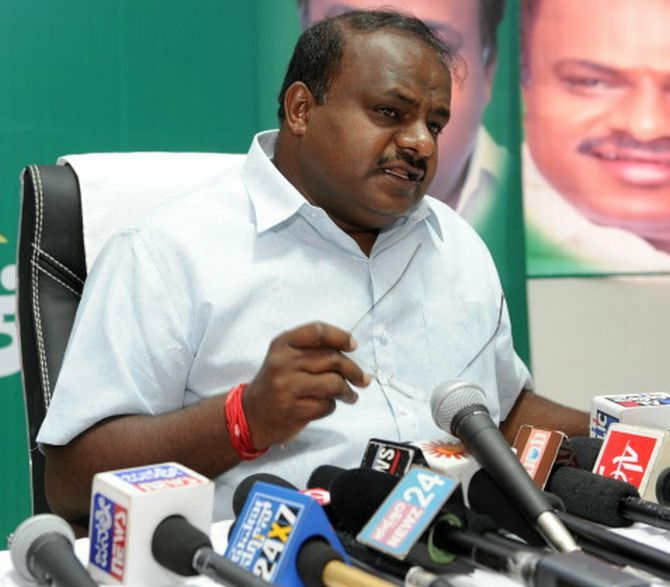 Karnataka Chief Minister HD Kumaraswamy has alleged that the BJP was trying to lure MLAs of the ruling combine, the Opposition party made a counter attack accusing Congress-JD(S) of horse-trading, leading to a fresh political war in the state. 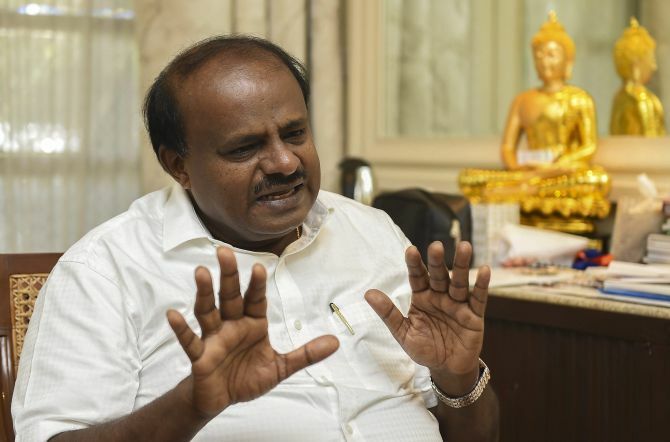 As the coalition government and the BJP levelled charges against each other, Kumaraswamy rubbished reports of an "instability" in his government, saying, "I have sufficient numbers for giving a stable government here, it is not necessary for Congress or JD(S) to poach the MLAs from BJP, we have sufficient numbers." 14:48 Man detained for allegedly sending e-mail threatening to kidnap Kejriwal's daughter: A man has been detained for allegedly sending an e-mail to Delhi Chief Minister Arvind Kejriwal threatening to kidnap his daughter, police said on Tuesday. The accused, Vikas Rai, is a resident of Samastipur in Bihar and has been preparing for competitive exams in Delhi, they added. Police have also seized the phone he allegedly used to send the e-mail. Further details are awaited as his questioning is underway. 14:36 Exclusive! 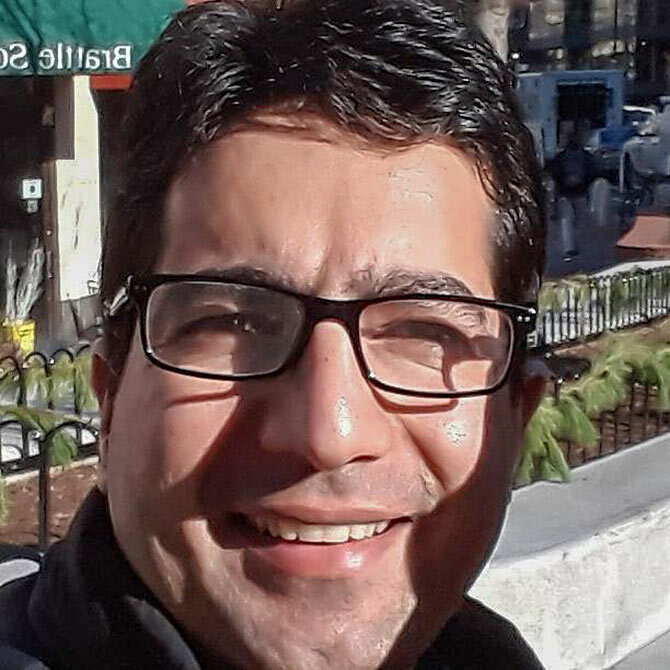 Why I Quit the IAS: Shah Faesal, the first Kashmiri to top the civil services, resigned after serving the Union government for nine years, to enter politics last week. Faesal, who trained as a doctor, returned to India after a fellowship at Harvard University's Kennedy School last month. 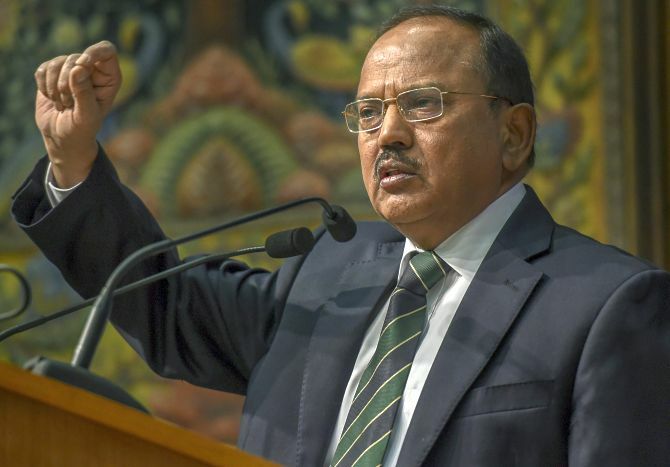 14:33 HC seeks Centre's response on plea for SIT probe into phone tapping of Doval: The Delhi High Court Tuesday sought response of the Centre on a plea seeking setting up of an SIT to investigate alleged illegal phone tapping of National Security Advisor Ajit Doval by the Central Bureau of Investigation. A bench of Chief Justice Rajendra Menon and Justice VK Rao also issued notice to the agency and sought its response on the plea which contended that such activities are "very dangerous for the country". 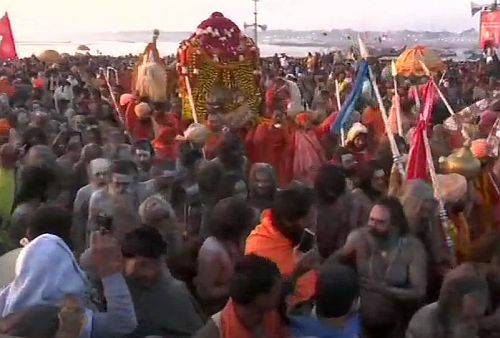 14:25 Kumbh Mela 2019: Yogi Govt's 'Gimmicks' Are Harming Hinduism. Read the column here. 14:15 Cong claims all K'taka MLAs loyal, but three still missing : Karnataka Minister DK Shivakumar from the Congress said the government was stable. "It will run for full five years under the leadership of CM HD Kumaraswamy. But another MLA Zameer Ahmed of the Congress admitted, "Around five MLAs of our party are in Mumbai. We will not sit silently if attempts of poaching are made, even we are in touch with some BJP MLAs. We had talked with 2-3 of our MLAs while other MLAs' phones are off. I can assure you no one will leave." 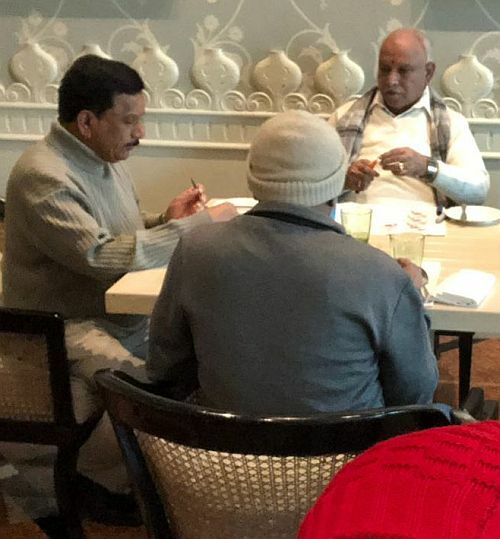 Meanwhile, BJP MLAs from Karnataka who have camped themselves in Gurugram on Monday evening said that they had assembled to strategise for the upcoming Lok Sabha polls and had not run away fearing poaching by the ruling Congress-JDS alliance. Speaking to ANI, Shashikala Jolle, an MLA from Nippani constituency, said: "There are 104 BJP MLAs and we are together. We have been called here to strategise for the upcoming Lok Sabha elections. There are no talks of forming the government. If there is anything, our leaders will tell you." Another BJP lawmaker Poornima Srinivas said that the BJP does not need to disrupt the Congress-Janata Dal (Secular) alliance government, claiming there are internal rifts among their ranks and they will fall out soon. "JD(S) and Congress both lacked the number to form the government. So they formed an alliance. Now, there are fights between them. There is no need for us to ensure a premature end for their reign," the MLA from Hiriyur constituency said. However, Karnataka BJP unit chief BS Yeddyurappa refuted those charges, saying that his party had nothing to do with the three Congress lawmakers' Mumbai visit, and accused the Congress-JDS alliance of poaching bid. Later in the day, Karnataka Chief Minister HD Kumaraswamy accused Yeddyurappa of fabricating stories, adding that there is no need for the Congress-JDS alliance to poach on any party's lawmakers. 13:42 Kharge calls out CBI interim chief's 'illegal' appointment : Leader of Congress Mallikarjuna Kharge has written to Prime Minister Narendra Modi, terming the appointment of M Nageswara Rao as the CBI's interim director "illegal" and demanding that a meeting of the selection committee be convened immediately to appoint a new chief of the probe agency. Kharge, who is part of the prime minister-headed three-member panel that removed Alok Verma as CBI chief, alleged that the government is scared of a CBI led by an "independent" director. "Actions of the government indicate that it's scared of a CBI headed by an independent director," Kharge wrote in his letter to PM Modi. He also demanded that the government come clean on the issues and make public the CVC report, Justice A K Patnaik's report and minutes of the January 10 meeting. Rao's appointment as CBI interim chief is "illegal", the Congress leader wrote in the letter. 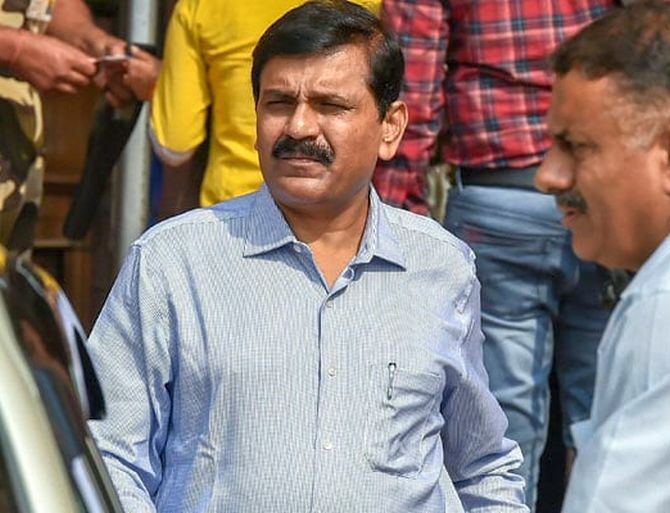 Barely two days after the Supreme Court reinstated him, Verma was Thursday last removed as CBI director by the high-powered committee headed by PM Modi on charges of corruption and dereliction of duty, in an unprecedented action in the central probe agency's 55-year history. 13:32 Smriti reacts to Rahul's jibe: Smriti Irani reacts to Rahul Gandhi's tweet on the PM being conferred the Phillip Kotler award. Irani quips: "Rich !!! Coming from a person whose illustrious family decided to confer the 'Bharat Ratna' on themselves." 13:28 Want to congratulate PM on winning 'world famous' award, quips Rahul : Taking a swipe at Prime Minister Narendra Modi for receiving the Philip Kotler Presidential award, Congress president Rahul Gandhi on Tuesday said he wants to "congratulate" him on winning "the world famous" prize that has no jury and has never been given out before. Gandhi's jibe comes a day after Modi received the first-ever Philip Kotler Presidential award in New Delhi. The award focuses on the triple bottom-line of 'people, profit and planet'. It will be offered annually to the leader of a nation, a statement from the Prime Minister's Office said. According to the award citation, Modi was selected for his "outstanding leadership for the nation". 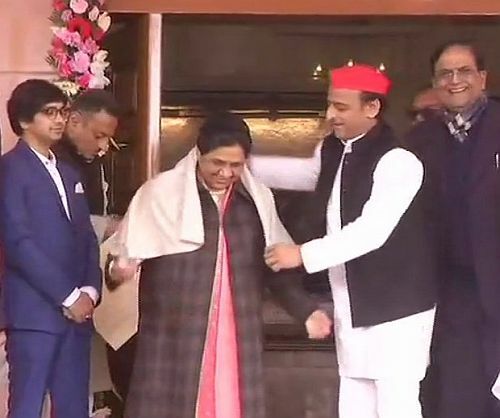 12:45 Akhilesh greets 'bua' on her birthday: Lucknow: Samajwadi Party chief Akhilesh Yadav greets Bahujan Samaj Party chief Mayawati at her residence, on her birthday today. The SP and the BSP have decided on a 50-50 seat-sharing deal under which each party will contest 38 seats. Both parties will leave two seats for the smaller parties. Uttar Pradesh has 80 Lok Sabha seats. The parties, however, will not contest in Amethi and Rae Bareli, represented by Congress president Rahul Gandhi and Sonia Gandhi respectively. 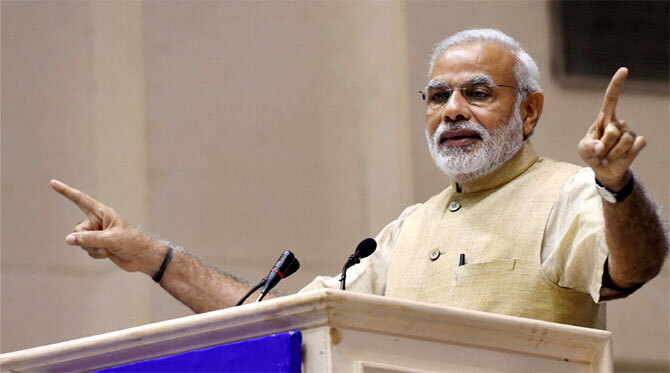 12:41 PM's Rs 1550 crore pre-poll bait for Odisha: Prime Minister Narendra Modi Tuesday accused the past governments at the Centre of ruling like "sultanates" and neglecting the country's rich heritage. He said the government led by him is committed not only to conserving and preserving the country's rich cultural heritage but also to clubbing ancient identities with modernity. "Past governments ruled like Sultanates and neglected our rich heritage. They ignored our glorious civilization and failed to pay attention to their preservation," Modi said at a BJP rally in the western Odisha town of Balangir. 12:33 How BJP's panna pramukhs will work in MP: After its hugely successful booth-level strategy failed to leave the usual impact on the Madhya Pradesh Assembly polls late last year, the BJP is working harder to fire up the rank and file. Its cadre in the state is now working on a three-month programme calendar prepared by the party's central leadership to woo back voters before the general elections. The party has appointed new panna pramukhs (page in charge) at the booth level after dropping many of the incumbents. The new panna pramukhs have each been handed a page from the electoral roll with mobile numbers and addresses of at least 15 families. It is the duty of the person in charge to contact these families from time to time, listen to their problems and then solve them, and, if possible, lead the members of these families to the polling booth during this year's election. 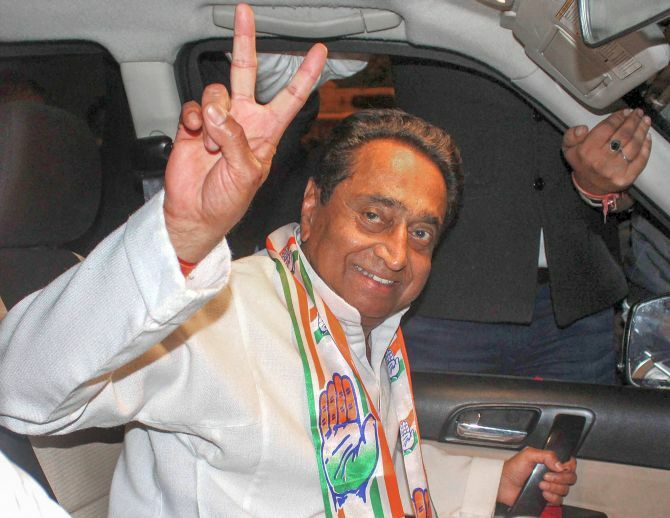 12:30 Cabinet expansion in MP : Madhya Pradesh Chief Minister Kamal Nath will expand his cabinet later this week. While a formal announcement on the expansion or the possible date is awaited, Nath's meeting with his party's central leadership in Delhi on Sunday fuelled speculation that it would happen before January 20. Other senior party leaders from the state were also present at the meeting where they gave their suggestions on the prospective candidates to be inducted into the CM's team. According to sources, MLAs of the Samajwadi Party (SP), Bahujan Samaj Party (BSP) and one independent MLA may get cabinet berths. Nath formed his cabinet on December 25, inducting 28 ministers, all from the Congress. Given that the Congress was able to form the government in the state with support from the SP and the BSP, it is likely their demands will be met. 12:22 SC to hear Zakia Jafri's plea against clean chit to Modi in Guj riots after four weeks: The Supreme Court on Tuesday said it would hear a plea by Zakia Jafri, challenging the SIT's clean chit to then Gujarat chief minister Narendra Modi in connection with the 2002 Godhra riots, after four weeks. The matter came up for hearing before a bench of Justices A M Khanwilkar and Ajay Rastogi. "You are asking for four weeks and we are giving you four weeks. List the matter after four weeks," the bench said. Jafri's counsel told the apex court that a notice needs to be issued in the plea as it pertains to alleged "larger conspiracy" during February 27, 2002 and May 2002. It also maintained that after the SIT gave a clean chit in its closure report before a trial judge, the petitioner filed a protest which was dismissed by the magistrate without considering "substantiated merits". 12:16 Pakistan violates ceasefire in Sunderbani Sector, Jammu and Kashmir. Indian Army is retaliating. 12:15 Indian-origin WH deputy spokesman Raj Shah quits Trump administration: Raj Shah, an Indian-origin top spokesman in the White House press office, has left US President Donald Trump's administration to join an arm of a lobbying firm, becoming the latest of several senior officials to quit in recent months. Shah, 34, White House deputy spokesman and a former researcher at the Republican National Committee, was in the administration since president Trump took office in January 2017. His portfolio recently included helping prepare Justice Brett M Kavanaugh for his Senate confirmation hearings to the Supreme Court. Shah will lead the Media Group, the press wing of Ballard Partners, a lobbying firm with offices in Florida and Washington, The New York Times reported. 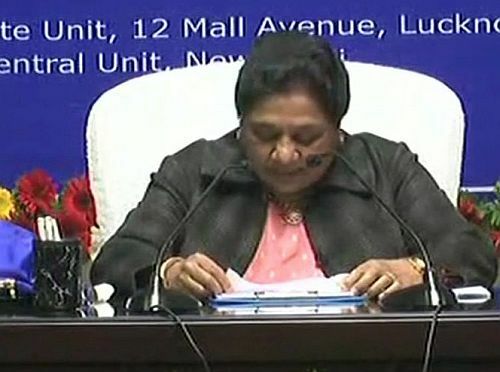 11:57 Forget past differences, work for victory of all SP-BSP candidates: Mayawati: Bahujan Samaj Party supremo Mayawati on Tuesday appealed to workers of her party and the Samajwadi Party to forget their past differences. On Saturday, the BSP and the SP announced an alliance in Uttar Pradesh for the upcoming Lok Sabha elections to unitedly fight the BJP. "Forget past differences and ensure victory of all joint candidates of the SP and the BSP. This will be my ideal birthday gift," Mayawati said at a press conference in Lucknow on the her 63rd birthday. 11:40 'This is the price you pay for speaking out against Modi': Almost three years after the controversy surrounding Jawaharlal Nehru University students, the Delhi police filed a chargesheet on Monday, January 14, under Sections 124A (sedition), 120B (criminal conspiracy) and other sections of the Indian Penal Code against Umar Khalid, Kanhaiya Kumar and several others. Khalid and others were also accused of shouting anti-India slogans during an event organised on the JNU campus on February 9, 2016, to 'commemorate the hanging of Parliament attack mastermind Afzal Guru'. The case was registered at the Vasant Kunj (North) police station following complaints by Bharatiya Janata Party MP Maheish Girri and the Akhil Bharatiya Vidyarthi Parishad, the student wing of the Rashtriya Swayamsevak Sangh. "In another four months, people will show the rulers of this country that they believe in the Constitution and anti-Constitutional forces who are ruling us will not be allowed to remain in power," Khalid tells Rediff.com's Syed Firdaus Ashraf. 11:37 JNU sedition case: Chargesheet to be heard on Jan 19: A Delhi court Tuesday fixed January 19 for consideration of the charge sheet against former Jawaharlal Nehru University Students' Union president Kanhaiya Kumar and others in the 2016 JNU sedition case. The court put up the matter for hearing on the date as Chief Metropolitan Magistrate Deepak Sherawat was on leave Tuesday. 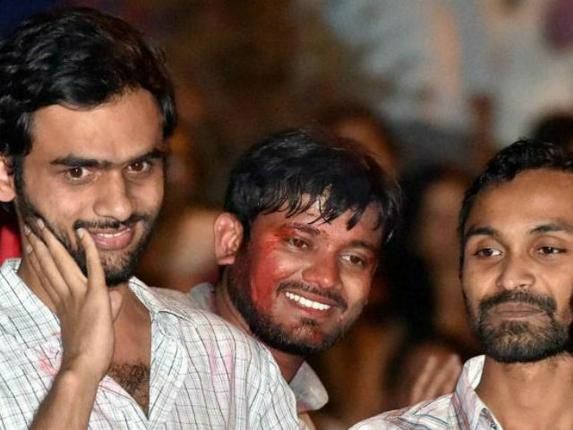 Image: Umar Khalid, Kanhaiya Kumar and Anirban Bhattacharya in a file pic, have been charged with sedition, which they deny. 11:06 Arun Jaitley travels to US for kidney ailment : Finance Minister Arun Jaitley has unexpectedly left for the US for a medical check up relating to his kidney ailment, sources said. Jaitley, who had undergone a renal transplant surgery on May 14, 2018, had not travelled abroad in last nine months. He was scheduled to attend the 10th India-UK Economic and Financial Dialogue in London in April last year, but cancelled his visit due to his kidney ailment. Sources said, he left for the US on Sunday night for a medical check up. 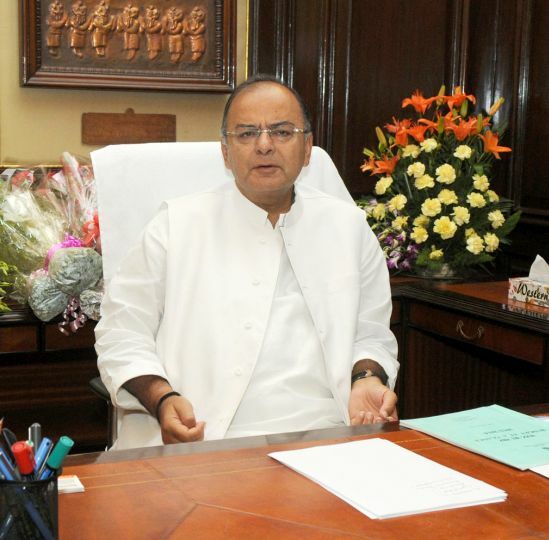 Jaitley is to present his sixth and the BJP-led NDA government's last budget on February 1. Though it is supposed to be an interim Budget, it is widely expected that his speech would have been full length budget speech. Jaitley was admitted to AIIMS last year in early April following which he underwent dialysis. He had a renal transplant surgery on May 14, 2018. 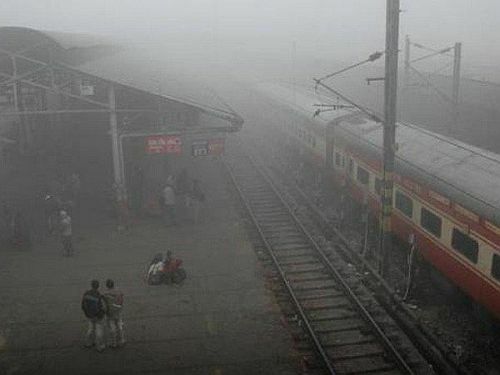 In his absence, Railways Minister Piyush Goyal was given the additional charge of Finance Ministry on May 14. Jaitley, 66, who had stopped attending office at the beginning of April, and was back in North Block - the seat of Finance Ministry - on August 23. Jaitley had in September 2014, undergone a bariatric surgery to treat weight gain that he suffered because of a long-standing diabetic condition. 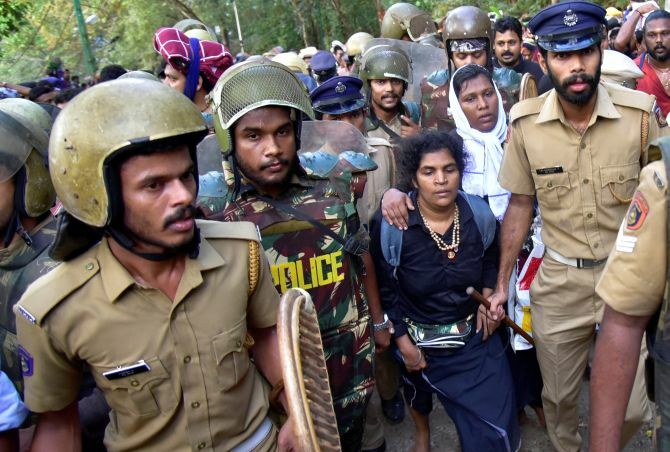 11:02 Woman who made history by entering Sabarimala attacked by relatives : Kanaka Durga, one of two women who made history by becoming the first woman in the menstruating age, to enter the Sabarimala hill temple in Kerala, was attacked by relatives on her return home yesterday. She has been admitted in a hospital at Perinthalmanna in Malappuram district. Her husband had filed a missing person report and his family had disowned her following her Januray 2 entry into the hill shrine dedicated to Lord Ayyappa, considered to be a celibate deity. Following threats by hardline groups Bindu Ammini, 40, a law lecturer at Kerala's Kannur University and Kanaka Durga, 39, a civil servant, had gone into hiding after entering the hill shrine. Their entry sparked widespread protests and a day-long strike in Kerala. The women had said they were facing threats from protesters, but that they trusted the authorities to keep them safe and planned to return home soon. Image: Kanaka Durga (wrapped in a white shawl) with Bindu Ammini had entered the shrine on the intervening night of January 1-2, 2019. 10:53 Dawn in Kumbh mela with a holy dip and cries of 'Har Har Gange' : At the break of dawn, chants of 'Har Har Gange' reached its crescendo as lakhs of devotees, ascetics and religious leaders of various orders congregated at the Sangam in Allahabad on Tuesday for a ritual dip, marking the beginning of the Kumbh Mela. They marched majestically, dancing and humming devotional songs, all the way to the confluence. "Me and my family came around 4:30 am thinking that it will be too crowded later. "Not that it is any less crowded now. 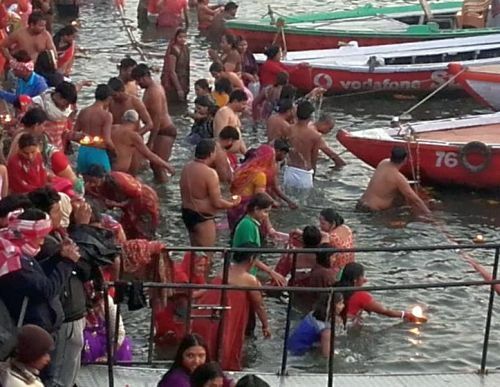 Also, we didn't want to miss the march of various akharas that will be taking part at the Shahi Snan ritual," said 35-year-old Anshuman, who had just taken the holy dip. 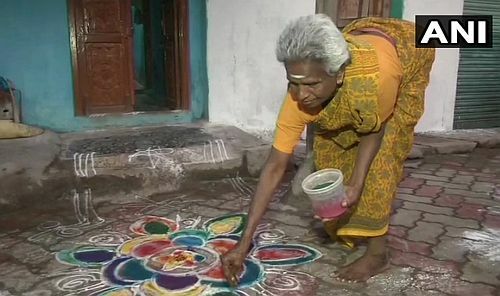 10:39 Tamil community in Dharavi, Mumbai, celebrates Pongal. 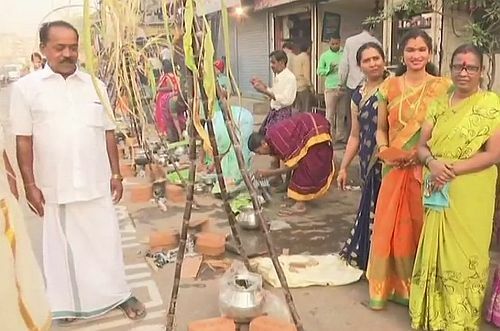 10:36 Pongal being celebrated in Madurai. 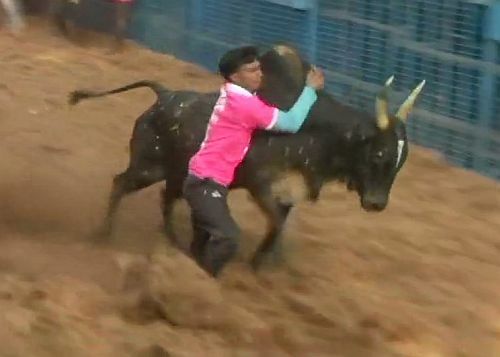 10:34 Tamil Nadu feeling bullish: Tamil Nadu: Jallikattu, a traditional bull-taming event begins in Avaniapuram, Madurai, on the occasion of Pongal. 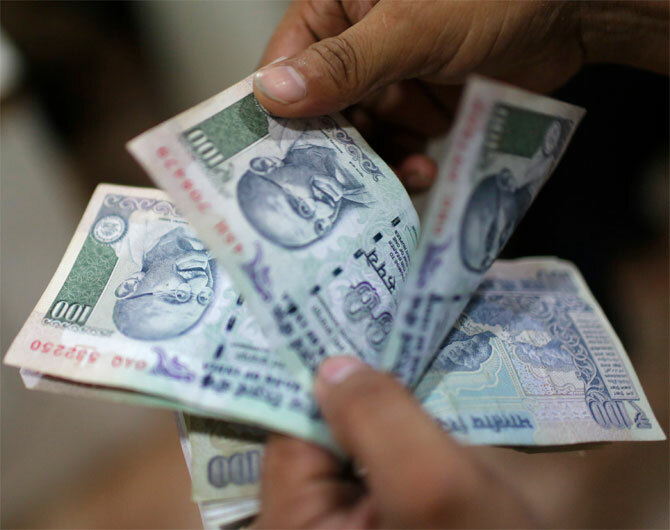 10:14 Rupee depreciates 10 paise against USD; falls below 71 mark: The rupee depreciated by 10 paise and fell below the 71 per dollar mark in opening trade Tuesday amid strengthening greenback, sustained foreign fund outflows and surging crude oil prices. 09:57 Sensex rallies over 300 points; Nifty reclaims 10,800 mark: The BSE benchmark Sensex Tuesday rallied over 300 points tracking positive cues from other Asian markets amid heavy buying by domestic institutional investors. The 30-share index Jumped 328.44 points, or 0.92 per cent, to 36,182 in early trade. Similarly, the NSE Nifty reclaimed the 10,800 mark by rising 93.65 points, or 0.87 per cent, to 10,831.25. In morning session on Tuesday, the biggest gainers in the Sensex pack were Yes Bank, Reliance, Infosys, Bajaj Auto, Asian Paints, ONGC, Bajaj Finance, SBI and TCS, surging up to 2 per cent. While, Bharti Airtel was the only loser in the index, down 0.44 per cent. Besides positive cues from other Asian markets, investor mood was boosted by encouraging macroeconomic numbers released on Monday. Retail inflation declined to an 18-month low of 2.19 per cent in December 2018 mainly on account of sliding prices of fruits, vegetables and fuel. BJP president Amit Shah celebrated the festival of Makar Sankranti, known as Uttarayan in Gujarat by flying kites with his supporters and party members. Shah flew kite on the terrace of a house in Vadaj area. 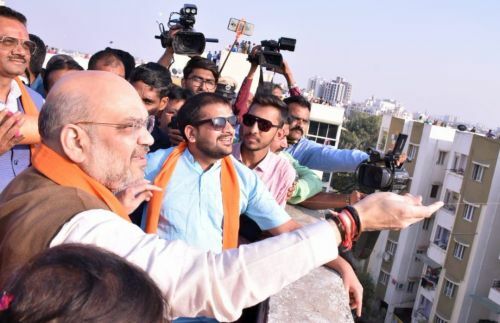 Shah was accompanied by Gujarat BJP president Jitu Vaghani, state youth wing president Rutvij Patel and dozens of party workers. 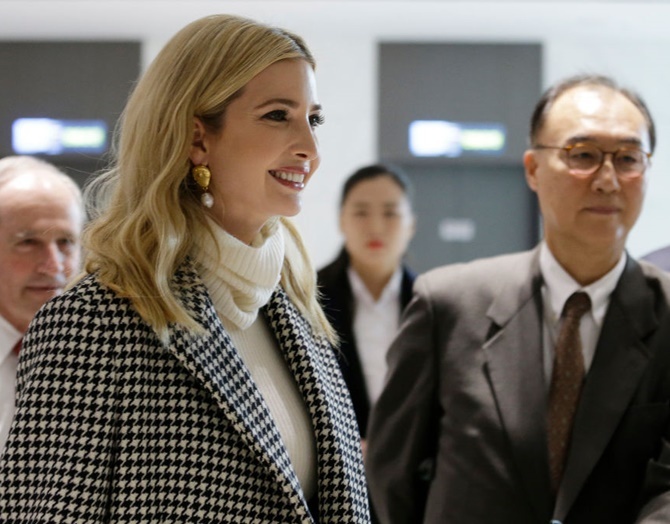 US President Donald Trump's daughter and advisor Ivanka will help the United States choose its candidate to lead the World Bank but she will not be the one, the White House said. Jim Yong Kim abruptly announced last week that he would cut short his tenure as president of the Washington-based global development lender more than three years before his second term was to end. Treasury Secretary Steven Mnuchin and White House Chief of Staff Mick Mulvaney "have asked Ivanka Trump to help manage the US nomination process as she's worked closely with the World Bank's leadership for the past two years," said Jessica Ditto, the White House Deputy Director of Communications. However, Ditto said reports that Ivanka Trump "is under consideration are false." London's The Financial Times reported on Friday that both Ivanka Trump and Washington's former United Nations ambassador Nikki Haley were among possible US candidates to replace Kim. Through an unwritten post-war agreement with Europe, the World Bank has always been led by an American while a European has always been in charge of the IMF. Besides saints and seers, foreign tourists have also started coming to attend the event. After a political controversy that drove Justice AK Sikri to turn down a post-retirement job offer, NDTV citing sources said that the Supreme Court judge did not want to be part of the three-member selection committee that decided to remove Alok Verma as CBI chief. 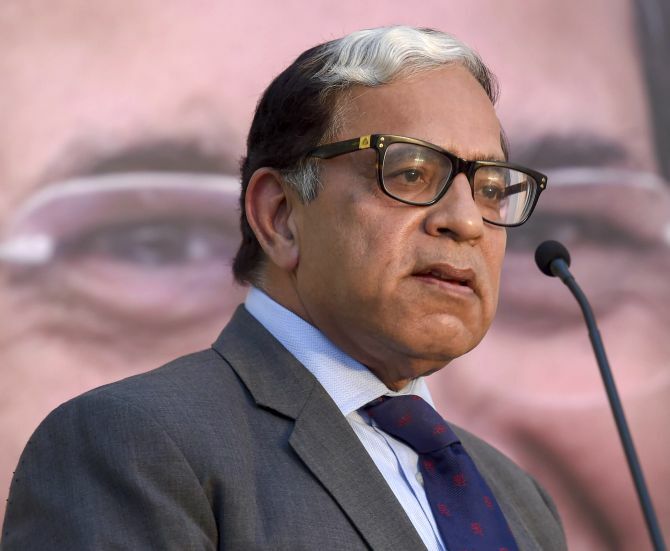 Justice Sikri, sources say, had conveyed his reluctance to the two other members of the high-powered panel, Prime Minister Narendra Modi and Congress leader Mallikarjun Kharge, the opposition's representative. He reportedly told them it was a "pure executive function". Opposition leaders have questioned why he agreed to be on the panel despite the possibility of conflict of interest. "In future, no judge would like to be part of this process of appointment. All judges will recuse themselves from this process," said sources close to Justice Sikri, whose vote was the decider in the sacking of Alok Verma from the CBI just two days after he was partially reinstated by the Supreme Court. "See, I don't want the controversy to be dragged. I want it to die," Justice Sikri told news agency PTI. Justice Sikri, 65, has now turned down the post of president/member of the London-based Commonwealth Secretariat Arbitral Tribunal, the arbiter of disputes among 53 countries in the Commonwealth. He was to take up the job after his retirement on March 6. Sources say Justice Sikri told the centre he had decided to withdraw his candidature to the London job as "he was pained". He had already made it clear, say the sources, that this was not a post with remuneration. 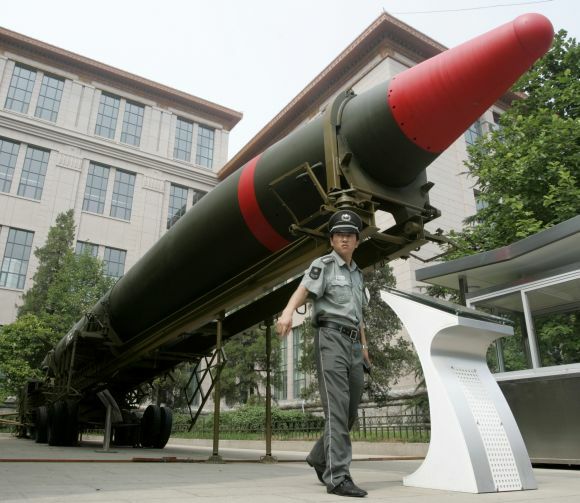 China has built an "Underground Steel Great Wall" below the mountains to hide its nuclear weapons from the potential attacks, said a top Chinese defence scientist who recently received the country's highest defence award from President Xi Jinping. "I have never had a thought of earning any prize money for my research, nor would I think it came too late. I am only grateful that national recognition offers a great opportunity to raise the public's national defence awareness, " he said.